A rain garden is a sunken garden bed that captures stormwater runoff from hard surfaces like rooftops, sidewalks and driveways, and allows it to soak back into the ground naturally. They are planted with hardy, native perennials that filter pollutants commonly found in stormwater runoff. This helps reduce the overall amount of runoff and pollution that gets into our streams, and maintains the natural hydrology so streams don’t go dry during the hot summer months. 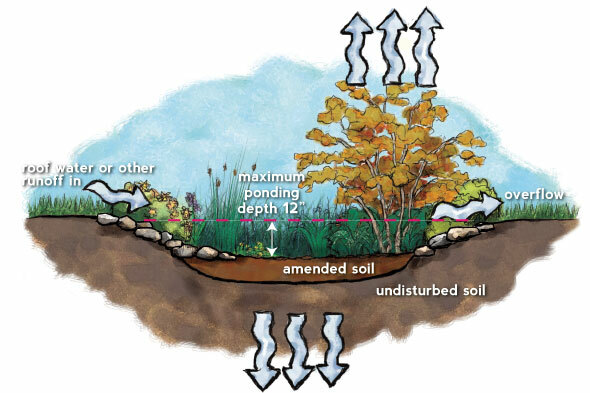 Check out the diagram below for a visual explanation of how rain gardens take in stormwater runoff, and learn some basics in the sections below! Click or tap on any of the questions below to explore that topic! Why is EMSWCD promoting rain gardens? According to the US Environmental Protection Agency (EPA), 70% of all water pollution comes from pollutants carried in stormwater runoff. Urban residents may inadvertently contribute to water pollution whenever rain water comes into contact with pet waste, landscape fertilizers, or oils and greases found on their property. Rain gardens are an important tool landowners can use to improve local water quality and reduce the negative impacts of stormwater on local streams. Rain gardens can beautify your home, improve drainage issues in your yard, and protect your neighborhood from localized flooding. Rain gardens provide habitat for pollinators, songbirds, butterflies and other wildlife. Rain gardens are a proven way to reduce water pollution in local streams and rivers. Rain gardens are an affordable, do-it-yourself option for homeowners. They require minimal time and skill to maintain, and actually work better over time! The primary difference is that rain gardens are bowl-shaped, not flat or raised like most perennial garden beds. You can plant many types of beautiful perennials in your rain garden, plus they serve as a tool to help manage rain water on your property. Attractive and functional – the best of both worlds! Why is stormwater (rain water runoff) a problem? Yard care products and chemical pollution from household activities are a leading cause of water pollution in our communities. When it rains, water flowing across our rooftops, driveways, and lawns create stormwater runoff. This runoff then flows across the landscape, picking up excess fertilizer, gas and oil, pet waste, and other pollutants and carries it into local streams and rivers. An impervious surface is any surface that prevents rain water from soaking into the soil, including roofs, roads, driveways, sidewalks, and (surprisingly) most lawns. Impervious surfaces increase the amount of storm water runoff exiting from an area. How can I reduce impervious surface on my property? Remove or reduce the size of concrete patios, sidewalks or driveways. Consider alternative hardscape surfaces that allow runoff to soak into the soil, such as permeable pavers. Replace poor draining lawns with beautiful garden beds. Install a rain garden to capture runoff from existing impervious surfaces. How do rain gardens prevent flooding? Most residential properties manage stormwater by ushering it out to the street, which increases the load on our urban infrastructure, and contributes to pollution. Rain gardens can be a tremendous asset in managing this stormwater runoff. With a rain garden, many properties can handle the majority of their stormwater on site. That can add up to a lot of water! In our climate, a rain garden receiving runoff from just 500 square feet of roof absorbs around 13,000 gallons of rain a year! To figure out how much runoff your roof (or other impermeable surface) receives, you can use this online rainfall volume calculator. Will rain gardens attract or breed mosquitoes? No. Properly designed and built rain gardens typically infiltrate all water within about a day – well before mosquito larvae hatch. Will a rain garden attract pollinators? Hopefully! Rain gardens planted with a variety of native trees, shrubs, and flowers are a great way to support pollinator communities. Rain gardens are designed to filter and absorb water into the soil, not to hold water. If it rains several days in a row, it is possible that your rain garden may have standing water until the rain stops and the water has time to soak into the soil. What types of plants are used in rain gardens? Native plants are ideal for planting in rain gardens, for many reasons! Native plants are well-adapted to the local climate – they are hardy and require very little maintenance. They also need less watering than plants from other climates – especially considering all the water they get in a rain garden! The right choice of plants will root well in your soil, maintaining the rain garden’s shape and preventing erosion as rainwater soaks in. Native plants also provide excellent habitat for birds, butterflies and beneficial insects that will eat the pests in your yard! Learn more about the benefits of native plants in the Native Plants section. Can I build a rain garden myself? Yes! 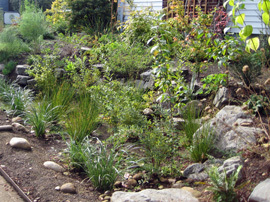 Rain gardens are a perfect do-it-yourself landscape project. To help you get started, EMSWCD offers Rain Garden 101 workshops that will help you better understand the planning, design, and installation process for a residential scale rain garden. Register for a workshop today! The size and shape of rain gardens is quite flexible, allowing them to fit into a variety of locations. Most guidelines suggest rain gardens be located 10 feet from building foundations and 5 feet from property lines. Also, locate your rain garden where any water overflow can safely flow into a lawn or adjacent garden bed – but not into your neighbor’s yard! 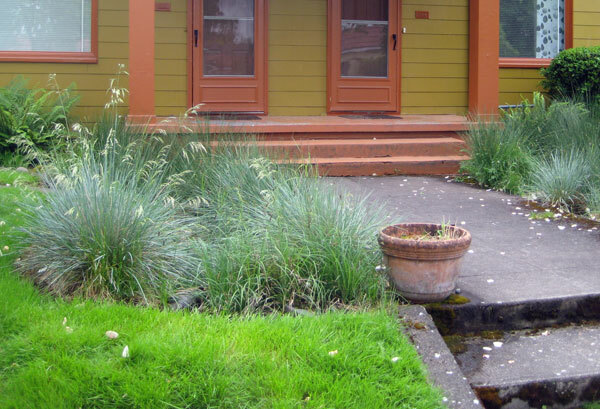 See the Oregon Rain Garden Guide for additional location considerations. How big should I make my rain garden? It depends on how much impervious surface will drain to it. A good rule of thumb is to make the rain garden 10% of the size of the area that drains to it. For example, if you are capturing water from 120 square feet of roof, the garden only needs to be 12 square feet in area. You can measure the length and width of your driveway, sidewalk, etc. with a simple tape measure. To measure your roof, go to your property in Google Maps and set it to Satellite view. Right click on a corner of your roof that will drain to your rain garden, and at you will see a drop-down menu. Click on “Measure Distance” at the bottom. Then left click on the corners or around the outside edge of the section(s) of roof that will drain to the rain garden. As you click, you will see a box at the bottom of the page showing the length of the line you are making. Once you have gone all the way around, close the shape by clicking on the first point again. The box at the bottom should now show the area of the shape as well as the length of the line. Whatever the number is, make your rain garden 10% of it. I have heavy clay soils. Can I plant a rain garden in my yard? Maybe. Rain gardens must be able to absorb water within 48 hours. In clay soils, you may need to design a larger, shallower rain garden to ensure timely drainage of the water. In some locations, amending clay soil with compost can help improve drainage. Where can I buy rain garden plants? Most retail plant nurseries have a wide selection of plants that are appropriate for rain gardens. Watch for native plant sales in the fall and winter for inexpensive native plant options. The Oregon Rain Garden Guide has a complete list of suggested rain garden plants. Where can I find someone to build a rain garden for me? If you would like assistance building a rain garden, visit the EMSWCD Conservation Directory for a list of landscape designers and contractors who have experience with rain garden projects. The Conservation Directory is not an endorsement for any of the listed vendors, but rather is intended to be a starting point for your research. What is the cost of a rain garden? Costs vary depending on a number of factors, including the size and complexity of the garden and whether you’re hiring a professional. For a do-it-yourself rain garden, expect to pay between $3 and $5 per square foot. If you’re hiring a contractor, the costs can exceed $10 to $15 per square foot. You can save money by purchasing smaller plants, and by recruiting volunteer help from friends and neighbors. EMSWCD also offers CLIP funding to certain qualifying residents to build a rain garden or for other types of stormwater management. Rain gardens can be designed to require very little maintenance by choosing the right plants, spacing plants closely together, applying mulch annually, and performing some occasional weeding – as little as 15 minutes of care per month during the summer. Will I need to water my rain garden during dry periods? Plan on watering your rain garden during the first two years to help young plants get established. You should water every one to two weeks for the first year, and every two to four weeks for the second year. After the first two years, rain gardens should require little to no watering during the summer – especially if you have an abundance of native plants! Do I need to fertilize my rain garden? No, rain gardens do not need to be fertilized. Remember, one of the benefits of rain gardens is their ability to clean and filter excess nutrients and chemicals from stormwater runoff. How can I get a yard sign for my rain garden? For new and prospective rain garden owners, hearing from friends and neighbors about their rain garden experience is incredibly valuable and helpful information. Therefore, if you register your rain garden and share your own rain garden “lessons learned,” we’ll send you an attractive 7”x9” aluminum yard sign for your rain garden! Learn more on the Rain Garden Registration page. Learn about rain gardens and their many benefits. You may be eligible for our Rain Garden Incentive!